Nothing is better than that FROSTY, hot off the dusty trail, but my passion is sharing a BIG beefy bottle of red. I’m a cowgirl & an Ol’ surfer, like I said , I love that frosty, I’ve earned it ! This is my happiest hour. 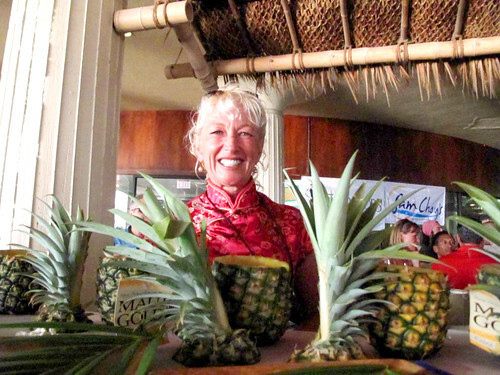 We are proud of many, All of our specialty drinks are made with fresh ingredients, Our award winning Tai Mai, is a must have, when our guests arrive on Island and their Aloha oi’. Oh my, there are many….perhaps our Lemon grass Ginger frost. Fresh ingredients & Happy customers. Open air, upscale, dress or casual, ocean activity to watch, warm sand on your toes, where the food & drink are memorable. A big jammy Zin, Cab blend, One more please…. Everyone is happy to be here, and to have their familiar and friendly bartender to look forward to, visit after visit. What is the newest drink you have created? Describe what’s in it. “Uncle Joe’s Ruby Red” Joe Gannon was my inspiration for this drink, he grows the best grapefruits and loves to bring me fresh squeezed juice from his trees. I created a Ruby red grapefruit with a mint sour infusion & a kosher salt rim, a balance of fresh fruit and herb, sweet, sour,& salty.